Dwarf Galaxy, Long Overlooked, Discovered In Our 'Hood : The Two-Way Tiny Kks3, 7 million light years distant, is made up mostly of star stuff that's just a billion or so years younger than the Big Bang. 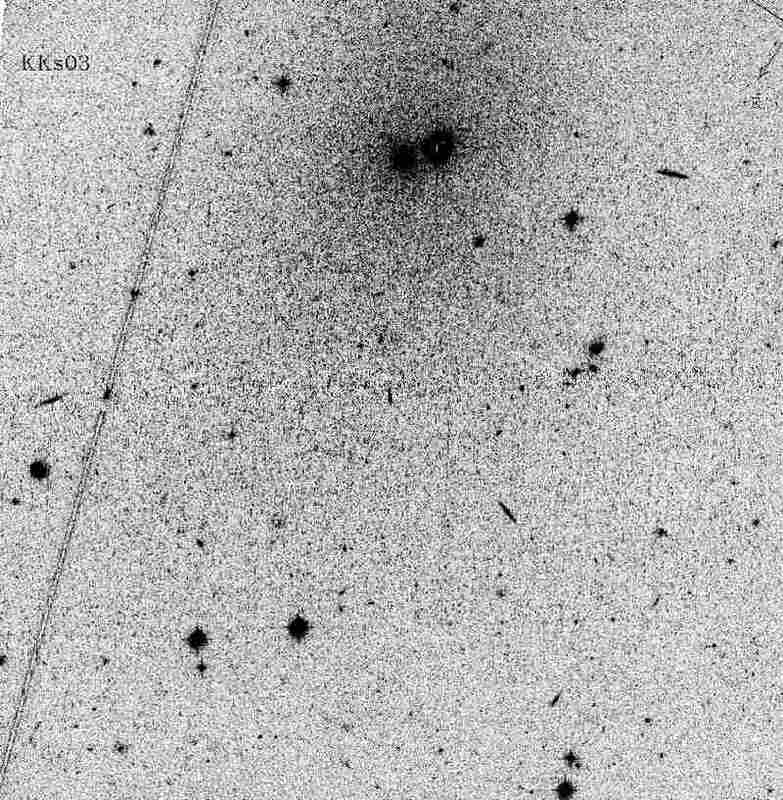 A negative image of Kks3, made using the Advanced Camera for Surveys on the Hubble Space Telescope. The core of the galaxy is the right hand dark object at the top center of the image. The newest galaxy to be discovered is actually very old – and very small. And it's right in our neighborhood of the universe. Although Kks3 is only 7 million light years away (about 2.5 times farther than our nearest large galaxy, Andromeda) at just 1/10,000 the stellar mass of our the Milky Way, it is tiny by galactic standards and incredibly easy to miss. About 2/3rds of the "dwarf spheroidal galaxy" is made up of star material formed 12 billion years ago, just a billion years and some change after the Big Bang. The find was published in the latest issue of Monthly Notices Letters of the Royal Astronomical Society. According to Sci-News.com, dwarf spheroidal galaxies such as Kks3 "have an absence of the raw materials needed for new generations of stars to form, leaving behind older and fainter relics. In almost every case, these raw materials seem to have been stripped out by nearby massive galaxies like Andromeda, so the vast majority of dSph objects are found near much bigger companions." Another dwarf spheroidal galaxy even nearer to us, KKR 25, was found in 1999 to be orbiting the Milky Way at an average distance of about 50,000 light years. According to the NASA/IPAC Extragalactic Database (NED), dwarf spheroidals are probably the most common galaxies in the universe. "Despite their low luminosity, they may contain large amounts of dark matter, and thus contribute greatly to the mass of the Universe," NED says. Dmitry Makarov from the Special Astrophysical Observatory in Karachai-Cherkessia and an author on the paper announcing Kks3's discovery, says finding such objects is extremely challenging even with space-based telescopes such as Hubble. "But with persistence, we're slowly building up a map of our local neighborhood, which turns out to be less empty than we thought," Makarov tells the Royal Astronomical Society. "It may be that are a huge number of [dwarf spheroidal galaxies] out there, something that would have profound consequences for our ideas about the evolution of the cosmos."